Climate fiction, or simply cli-fi, is a newly coined term for novels and films which focus on the consequences of global warming. New research from University of Copenhagen shows how these fictions serve as a mental laboratory that allows us to simulate the potential consequences of climate change and imagine other living conditions. “Global warming is much more than scientific data on changes in the atmosphere; it is also a cultural phenomenon in which meaning is being shaped by the books we read and the films we see. And there are so many of them now that we can speak of a completely new genre, cli-fi, says PhD Gregers Andersen who has just defended his thesis Climate-Changed Existence and its Worlds; Global Warming in Fiction and Philosophy at the University of Copenhagen. In his thesis, Gregers Andersen analyses 40 different novels, short stories, and films produced between 1977 and 2014 which all, in one way or the other, employ global warming as a theme. And in the 40 works, he has identified five themes that each represents global warming in a different way: The Social Breakdown, The Judgment, The Conspiracy, The Loss of Wilderness and The Sphere. 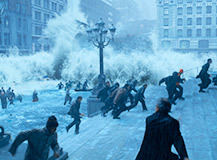 The 2004 Hollywood blockbuster The Day After Tomorrow is a prime example of the theme Gregers Andersen has termed the Judgment; during the film, global warming has catastrophic consequences and causes a new ice age that lays most of Earth waste. “In The Day After Tomorrow and a number of similar fictions, nature passes moral judgment on mankind’s exploitation of Earth’s resources and becomes an avenger who, quite literally, clears the air and thus restores the proper balance between man and nature,” Gregers Andersen says. When climate change leads to conflicts about natural resources and social disintegration. Man is punished by nature for exploiting its resources. Climate change is seen as a scientific and political conspiracy to mislead the public. Global warming destroys the planet’s last places of wilderness. The wilderness is depicted as a place of extraordinary aesthetic value. Man adapts to climate changes by constructing artificial atmospheres. A theme that is often seen in science fiction.